Modern earth scientists' studies in seismology, as in many other areas, are informed by plate tectonics, and to understand the causes of earthquakes and volcanoes, it is necessary to understand the basics of tectonics as well as plate tectonics theory. The latter subject is discussed in depth within a separate essay, which the reader is encouraged to consult for a more detailed explanation of concepts covered briefly here. The term tectonism refers to deformation of the lithosphere, the upper layer of Earth's interior. Tectonics is the study of this deformation, which results from the release and redistribution of energy from Earth's core. The core is an extremely dense region, composed primarily of iron and another, lighter element (possibly sulfur), and is divided between a solid inner core with a radius of about 760 mi. (1,220 km) and a liquid outer core about 1,750 mi. (2,820 km) thick. Under the effects of these stresses, rocks experience strain, or a change in dimension as they bend, warp, slide, break, flow as though they were liquids, or melt. This strain, in turn, leads to a release of energy in the form of seismic waves. These waves may cause faults, or fractures, as well as folds, or bends in the rock structure, which manifest on the surface in the form of earthquakes, volcanoes, and other varieties of seismic activity. 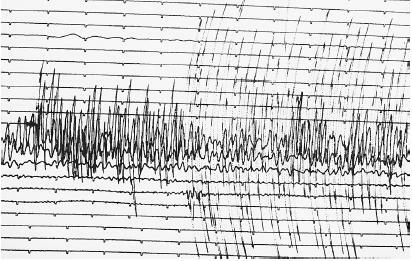 Seismology is the study of these waves as well as the movements and vibrations that produce them. The theory of continental drift, discussed in Plate Tectonics, is based on the idea that the configuration of Earth's continents was once different thanit is today. Integral to this theory is the accompanying idea that some of the individual land masses of today once were joined in other continental forms and that the land masses later moved totheir present locations. Continental drift theory was introduced in 1915 by the German geophysicist and meteorologist Alfred Wegener (1880-1930), but it failed to gain acceptance for half a century, in large part because it offered no explanation as to how the continents drifted. That explanation came in the 1960s with the development of plate tectonics, the name both of a theory and of a specialization of tectonics. As an area of study, plate tectonics deals with the large features of the lithosphere and the forces that shape them. As a theory, it explains the processes that have shaped Earth in terms of plates (large movable segments of the lithosphere) and their movement. THE PLATES AND SEISMIC ACTIVITY. There are several major plates, some of which are listed in Plate Tectonics. That essay also discusses modern theories regarding the means by which continents broke apart many millions of years ago and then drifted back together, slamming into one another to form a number of notable features, such as the high mountains between the Indian subcontinent and the Eurasian landmass. Nor have the continents stopped moving; they continue to do so, though at a rate too slow to be noticed in a lifetime or even over the course of several generations. Based on its current rate of movement, in another 6,000 years—approximately the span of time since human civilization began—North America will have drifted about 600 ft. (183 m). For the most part, the continents we know today are composed of single plates. For instance, South America sits on its own plate, which includes the southwestern quadrant of the Atlantic. But there are exceptions, an example being India itself, which is part of the Indo-Australian plate. Also notable is the Juan de Fuca Plate, a small portion of land attached to the North American continent and comprising the region from northern California to southern British Columbia. It so happens that this area is home to an unusual amount of volcanic activity. Southern California, where the North American and Pacific plates meet on the San Andreas fault, also is extremely prone to earthquakes, as is Japan, whose islands straddle the Philippine, Eurasian, and Pacific plates. Hawaii is another site of seismic activity in the form of volcanoes, but it does not lie at the nexus of any major plates. Instead, it is situated squarely atop the Pacific Plate, which is moving northward over a hot spot, a region of high volcanic activity. The hot spot remains more or less stationary, while the Pacific Plate moves across it; this explains why the volcanoes of northern Hawaii are generally dormant, whereas many volcanoes in the southern part of the island chain are still active. Plates interact by moving toward each other (convergence), away from each other (divergence), or past each other (transform motion). When a continental plate converges with an oceanic plate (the differences between these types are discussed in Plate Tectonics), the much sturdier continental plate plows over the oceanic one. This is called subduction. The subducted plate undergoes partial melting, leading to the formation of volcanic chains, as in the nexus of the Juan de Fuca and Pacific or the South American and Nazca plates. The subduction of the Nazca Plate, which lies to the west of South America, helped form the Andes. 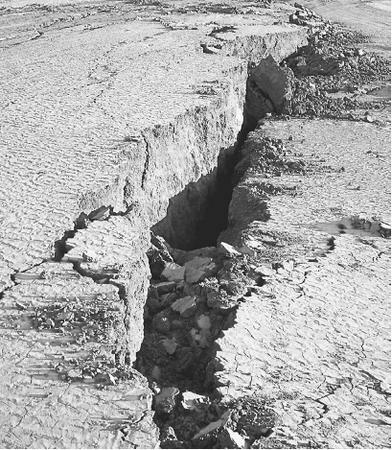 Transform margins result in the formation of faults and earthquake zones, an example being the volatile San Andreas Fault.